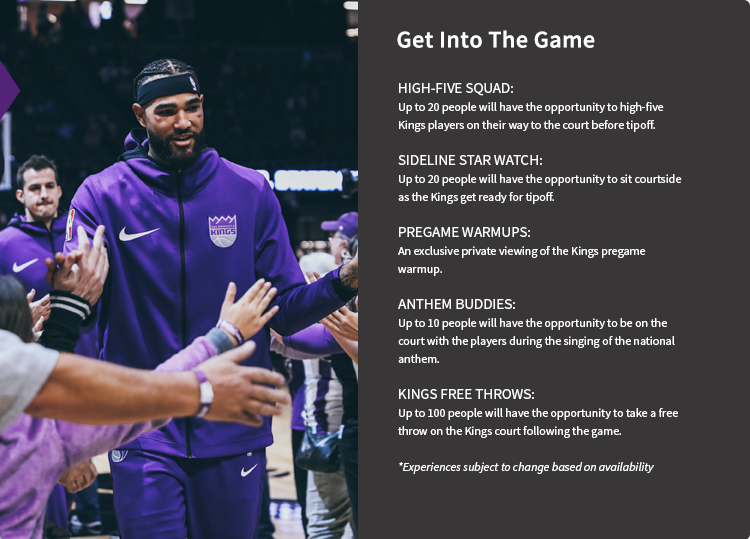 Bringing a group of 10 or more to a Kings game gets you unbelievable perks – discounted tickets, on-court experiences and much more. 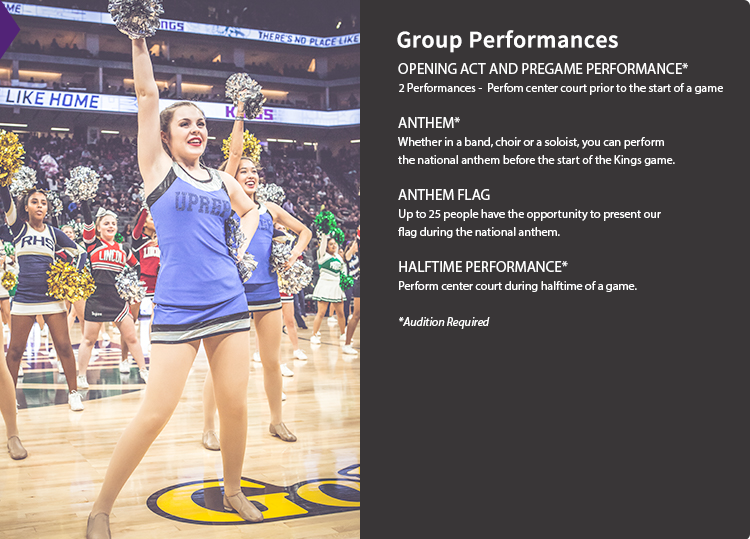 Interested in bringing your group to Golden 1 Center? Please select from the options below. *Ask your personal Group Account Manager about these options. Pricing varies by game and seat location. Please call 916-526-1473 for pricing and seat availability. Q: WHAT IS CONSIDERED A KINGS GROUPS OUTING? 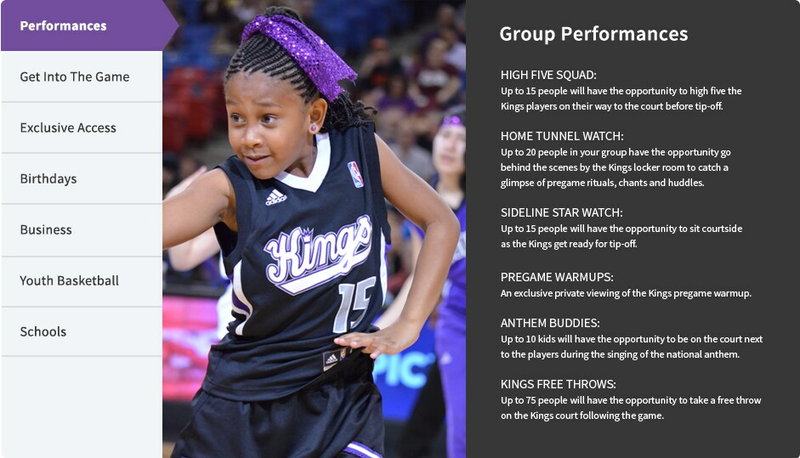 A: A Kings Groups outing begins with the minimum purchase of 10 tickets. Q: WHAT IS A FAN EXPERIENCE AND HOW DO I BOOK ONE? A: Fan Experiences are exclusive events for Kings Groups that are designed to provide great Kings memories for your group. To book a Fan Experience, please contact your personal Group Account Manager or call the Group ticket line at 916-526-1473. There is a minimum spend requirement for each experience. Q: ONCE I’VE BOOKED A FAN EXPERIENCE, WHEN DO I RECEIVE DETAILS? A: A member from our Sales Operations Team will be reaching out to explain full details of the experience itself, number of participants and any other requirements. 30 days prior to your game, you will receive full logistics and standard operating procedures to share with the members of your group. Q: WHEN WILL I RECEIVE MY KINGS GROUPS TICKETS? A: Upon full payment, digital tickets will be made available via your ClickTix account. 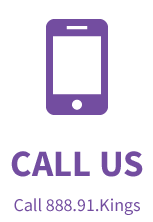 ClickTix is an online tool that provides a convenient way to distribute the tickets to your group, and allows everyone in the group to use their mobile device for entry into the game. Please note that we have moved to digital tickets in place of PDFs. Digital tickets are the safest, most convenient and flexible way to receive and manage tickets while increasing protection against fraud. Click here to learn more about how to manage your tickets via ClickTix this season. Q: WHAT HAPPENS IF OUR GROUP DOES NOT REACH THE MINIMUM SPEND REQUIREMENT FOR THE FAN EXPERIENCE WE HAVE RESERVED? A: The Sacramento Kings Group Sales Department reserves the right to release the Fan Experience you selected if your group does not reach the minimum spend requirement. Q: AM I ABLE TO ADD MORE SEATS TO MY ORIGINAL ORDER IF NEEDED? A: Although it's not guaranteed that additional tickets will be available in your group's location, additional seats may be purchased after your original order. Please Note: Tickets are subject to availability and could be at a higher rate. 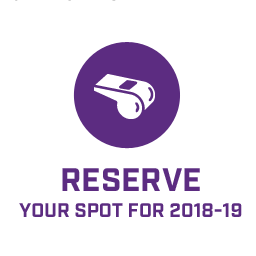 A: NBA policy strictly prohibits the use of still photos or video footage for commercial purposes without the express written consent of the NBA head office. Cameras containing detachable lenses are not permitted into Golden 1 Center. Video cameras, and taking of video with other devices, are prohibited. We reserve the right to disallow cameras that, in the opinion of management, will be used to produce professionally marketed images. Tripods and other equipment that could pose a tripping hazard are not permitted. Standing or positioning oneself in order to take pictures in a manner that obstructs the view or enjoyment of the event by others is not permitted. Q: IS WHEELCHAIR ACCESSIBLE SEATING AVAILABLE FOR KINGS GROUPS? 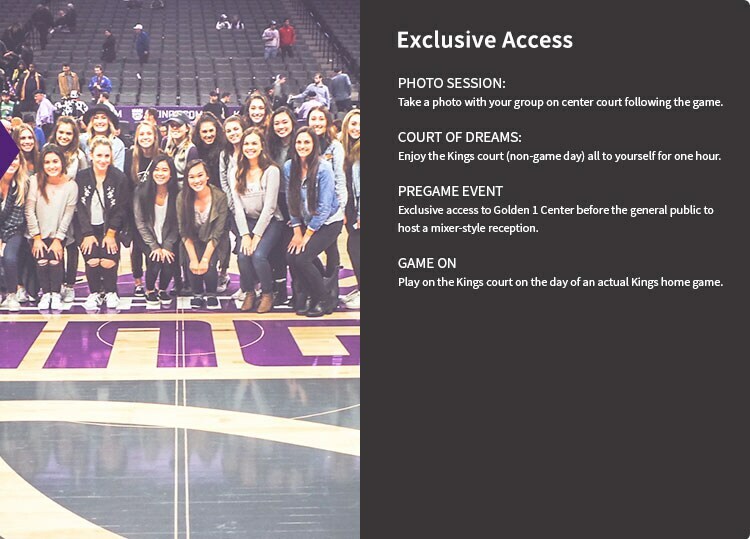 A: Yes, to arrange wheelchair accessible seating, please contact your personal Group Account Manager at 888-91-KINGS. We will do our best to accommodate, however please note: Seating is subject to availability. Q: WHAT TIME DO DOORS OPEN FOR KINGS GAMES? A: Arena doors open approximately one and a half hours prior to tipoff. Q: WHERE DO I PARK AT GOLDEN 1 CENTER? A: There are a number of parking garages located near Golden 1 Center. You can reserve a guaranteed parking spot in advance at SacPark.org. 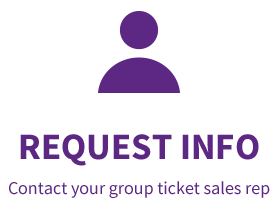 Additional transportation and parking information can be found at Kings.com/Parking. Q: CAN I PURCHASE KINGS GROUP TICKETS FOR ANY 2018-19 GAME? A: Group tickets are available for all games during the 2018-19 season based on availability. 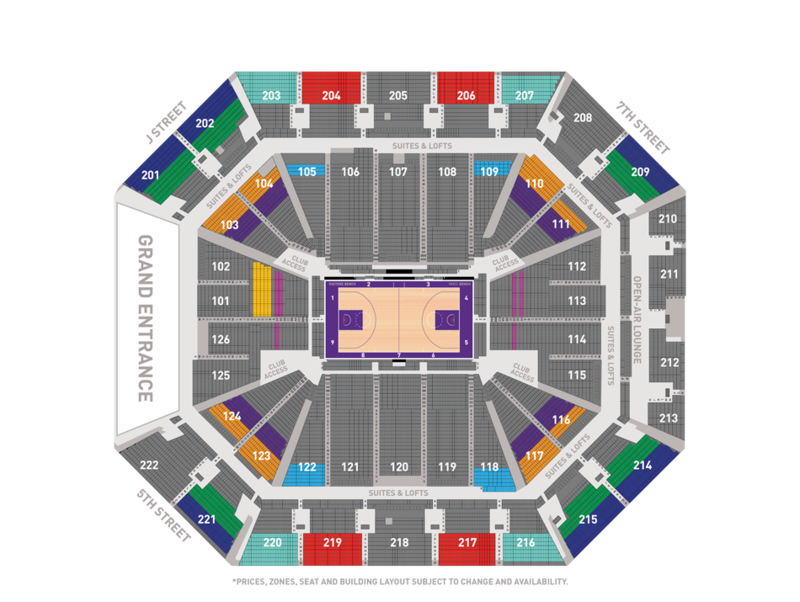 You are welcome to buy individual tickets to those games either online at Kings.com/Tickets or at the Golden 1 Center box office. Please note that individual buyers are limited to eight tickets per game. This is subject to change at any time. A: Children two years of age or older must have a ticket in order to enter the arena. Children under two years of age may enter without a ticket, but must sit on a parent's/guardian's lap. Q: CAN MY GROUP BRING OUTSIDE FOOD OR BEVERAGES INTO THE ARENA? A: Outside food, beverages, coolers, bottles and cans are not permitted in the arena. Q. CAN I BRING A BACKPACK OR DUFFLE BAG? A: Backpacks or any type of duffle bag are not permitted inside Golden 1 Center. Please check www.golden1center.com for a complete list of all restrictions.